Kevin Anthony Dunn was born on 5th June 1965 in Gloucester. He attended ChurchdownSchool and on leaving school, became a bricklayer. He played rugby for Spartans and Lydney before joining Gloucester. Having impressed for Gloucester United, especially at throw-ins, he made his first team debut against Glamorgan Wanderers at Kingsholm on 17th September 1986. He scored a try on his debut. In his debut season, he played 31 games. In all, he played 151 games for Gloucester (+5 as a substitute) and scored 37 tries (148 points). Kevin was twice on the bench for England, but did not actually play. He represented England A, gaining 17 caps. 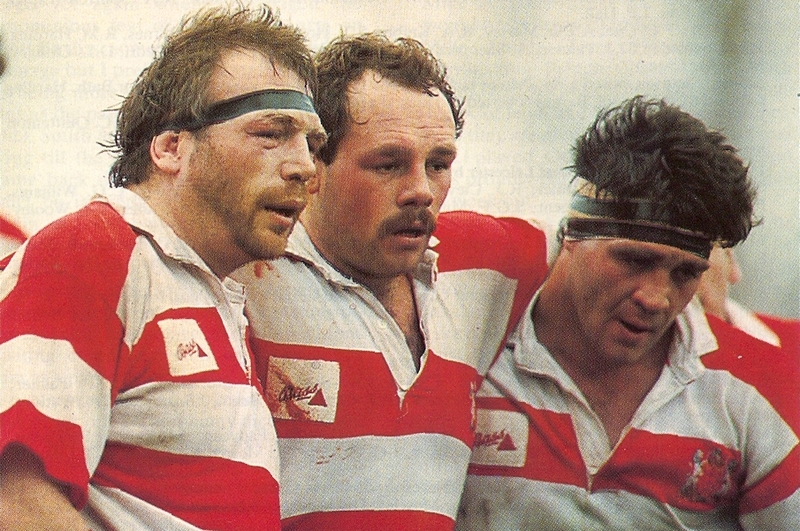 In Gloucester’s great 1989-90 season when they finished runners-up in both league and cup he played 30 games and scored 13 tries. He played in the 1990 Pilkington Cup Final and in 10 of the 11 league games. Kevin left Gloucester in July 1992 to join Wasps. He was hoping that the move to London would help him to force his way into the England side. He made 68 appearances for Wasps between 1992 and 1997 scoring 2 tries. He played for Bristol during the 1997/8 season making 12 appearances. He played for Cardiff for one season (1998/9 ) but only made one appearance before breaking his hand.